About four years ago, Connecticut Rush Soccer Club decided to test the waters of EDP. So, the Connecticut youth club entered its 02-03 girls team into the competition. The team did so well that the organization placed a Boys team in the same age group. "We had a good experience with those initial teams," CT Rush regional program director Renato Topalli said. "They played at a very good level, got good competition. They had to travel a little bit, but the competition was good. Since then we added more and more teams." Today, Connecticut Rush has all of its elite teams playing in the EDP Division 1 of various Boys and Girls age groups with another two squads performing at the Division 2 level. "It has been a good fit for us," Topalli said. "We kind of eased into it and we're all in." And as it has turned out, the EDP leagues have been a good fit for a few other clubs from the Constitution State. Sporting CT participated in EDP two years ago before switching back to a local league for a year. 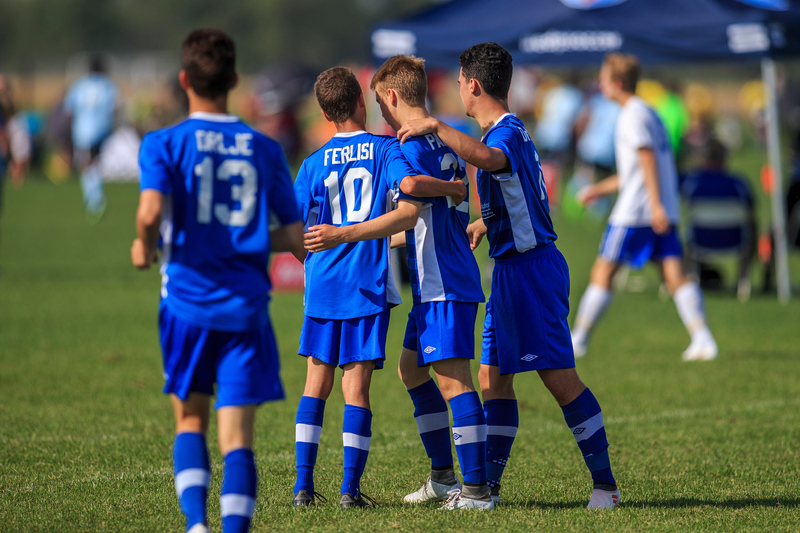 It didn't work out and Sporting returned to EDP in 2018, since then they haven't looked back, Goran Vasic, executive director and director of coaching for the club and director of coaching of Middletown Youth Soccer explained. "This is our first year back in EDP and we're planning to stay for a long time right now," Vasic said. "With the structure of the league they are making it possible for our teams to play in a national league and represent the club at the national level. So that's something we're looking forward to." Shoreline FC has been a part of EDP since 2013. Danny Simpson, the club's owner and director of coaching, said that his club has seen many changes in the program over the past several years. "We've seen the upbringing and the development of our program," he said. "We see a lot of teams improving and we see the quality of the opposition has never waned. So, all good, all good." Competition has been the leading factor for many clubs in deciding to join EDP. Coaches want to see their teams pushed. After all, there is nothing worse than playing in one-sided games all season long. They want to see their players and teams develop. "That's why we chose EDP in 2013," Simpson said. "As our club has grown and strengthened, the top EDP division is the pinnacle for what our strongest teams strive towards. By the time they reach 12, we want them to be good enough to be on the EDP level and from then on to compete to rise to become a Division 1 and then strive to see if you have a chance to winning it." Shoreline's first team joined the league in 2013 and competed until it won a Division 1 title as an 18U team. It took a while for the team to reach its potential and earn its just rewards. "So, I don't think it's a handout" Simpson said, "Some of these leagues and tournaments, they hand out trophies." Club officials have all noticed there are less politics involved now. It's all about playing, playing at the highest level possible and developing players. "When we look on how well organized the league is, we look at what teams are signed up to play against our teams, and in the best interests of our club, to know that we're playing against the best possible kids around. That's how you produce good young players to take it to the next level," Vasic said. "And we found ourselves doing that in EDP this year." Topalli liked the idea of promotion of and relegation as well. "Absolutely. As coaches of the club, we want to compete at the highest level in EDP and it gives us the platform to compete at the highest level," he said. "So, whether you're playing at EDP Division 1 and you're trying to win the league, that's the goal. If you're in Division 2, you're trying to move up to Division 1. "That's the goal to compete at the highest level and EDP provides us with that platform." CT Rush's 2006 girls team won its Division 1 while its boys counterparts finished third, Topalli noted, adding that the 2007 boys side finished atop EDP Division 2. It's all about development—reaching the next level. "Exactly," Simpson said. "That's why with Shoreline we use the word development with a purpose. So the development of a team, if you could establish yourself as a mid-level D2 team in your first season, and then by the spring of the next season, compete in the top three, then who knows? Then by 14, could you be a top three team? Maybe and look for promotion." "Success doesn't always mean trophies. The great thing about EDP is that every game's a stacked game. Every game is competitive. What we like is if make three errors in a row, a team punishes you. And vice versa. And that's real football. Some of the leagues that we've had teams in the scorelines are so see-sawed, it’s unbelievable." All three club officials said they have enjoyed the working relationship between their organizations and EDP. "We work together with EDP pretty well," Topalli said. "They listen to us. They're open to our ideas. It gives us a good platform. We supply them with some pretty strong level teams. So overall it seems like a good fit either way. They work with us as well. They are pretty open to our ideas." Vasic gave EDP a thumb's up because it is a gateway to regional and national competition. "It's a big deal because if you have two, three of four good teams in our club they can take it to the next level," he said. "We want to give them the best possible chance to do that. With the national league level they will have chance. If they win it, they go straight to the nationals and try to win it. And if they're not there yet, we have to work harder to make teams able to go to that kind of competition." For the three aforementioned teams, the EDP leagues will mean less travel for many matches, and that sounds good to them. "It's very exciting for us," Vasic said. "We are looking to reduce the travel costs for parents and players to travel too long to play games. That will give us a lot more opportunity to travel less and play against very competitive teams in states such as Vermont and New Hampshire. We are looking forward to having good, competitive games." Topalli agrees and elaborated. "It's good to play the top teams in our region, New England," he said. "It's good that EDP is expanding, coming to New England, and really build in a platform in New England for some of the high-level teams here to compete together on a regular basis." Youth soccer is continuing to grow in Connecticut. The Hartford Courant reported in 2018 that the Connecticut Junior Soccer Association had 68,298 registered youth players in 2017, one of the highest rates per capita in the country. U.S. Soccer reported there were about 121,670 people that played soccer in Connecticut that year. Those numbers included data from United States Specialty Sports Association, which also encompasses adult playing the beautiful game. The three clubs have seen great progress in Connecticut youth soccer over the years. "The growth of the youth has just been tremendous through the years," Vasic said. "Every year we see more and more kids joining clubs." That went ditto for Topalli, who has been coaching in the state for 11 years. "It certainly has grown," he said. "We have a lot more clubs than what we've had in the past. The number of kids playing in Connecticut, I also think that number has grown as well. I do think the level of play has increased throughout this area. There were three clubs 12-13 years ago. Now it's probably over 20 and maybe more. And some of them are towns [clubs] going premier and doing their own thing. I also think the high level of play has been extremely higher than it has in the past. "Connecticut is a small soccer state when you compare it to New York, New Jersey, Virginia and Pennsylvania. We're not supposed to fare pretty well against the top teams in the other regions and now we are. It's not just us, Connecticut Rush. There are other teams nearby that are getting teams to go to regionals to compete against the best teams, go to EDP tournaments, go to some high-level showcases, and do pretty well." Simpson has been involved with Connecticut youth soccer for more than a quarter century. He has coached in EDP and was a coach educator for B and D licenses before the system was restructured. "One of the biggest things that I've been impressed with....is the coaches who want to improve their knowledge," he said. "It's been fantastic to take these coaches on courses and improve them on coaching, which in, turn improves the kids they're working with. It's been a great growth." Growing and taking it to the next level—that's what it's all about.